This bed, a fine center piece of any bedroom, will make a statement of rustic relaxation. The rustic appeal of the bed comes from its dark, cafe finish, exposed screw heads, tapered feet and reclaimed wood look. 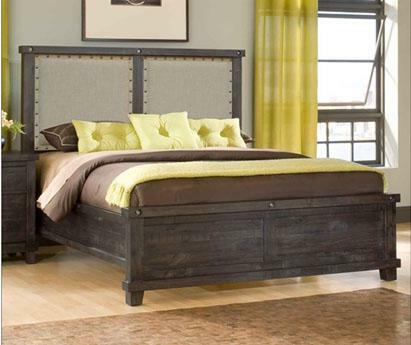 This bed features a fabric headboard with nail head trim, that adds extra character to the bed. The Yosemite Low Profile California King Bed with Rustic Fabric Headboard by Modus International at Michael's Furniture Warehouse in the San Fernando & Los Angeles area. Product availability may vary. Contact us for the most current availability on this product. Case Detail Simple slightly tapered block legs. Drawer / Shelf Construction Sanded and stained interiors. 5-sided hardwood plywood drawer boxes with English dovetail corner. Felt lined top drawers on bedroom storage pieces. Case Construction Mortise and tenon frames. Tongue and groove tops, frames, and side panels for strength and durability. The rustic beauty and relaxing tone of the Yosemite collection will establish a feeling of comfort in your bedroom and dining room that you deserve. This home collection incorporates very earthy styles; dark finish, reclaimed wood look with rough hewn planks, exposed screws and simple drawer handles, all of which create the rustic, relaxing feel with an upscale modern farmhouse style. The entire collection is made from 100% solid wood providing extra durability and quality. Drawer interiors are sanded and stained and the top drawers are felt lined and feature full extension drawer guide system. The Yosemite collection is a great option if you are looking for Rustic Casual furniture in the San Fernando & Los Angeles area. Browse other items in the Yosemite collection from Michael's Furniture Warehouse in the San Fernando & Los Angeles area.